A group led by Lundin Petroleum AB’s Norway subsidiary has finished tests at the previously announced Luno II discovery on the southwestern flank of the Utsira high in the North Sea 15 km south of Lundin-operated Edvard Grieg field. The 16/4-6S exploratory well in 101 m of water on PL359 flowed at more than 2,000 b/d of oil on a 48/64-in. choke with a gas-oil ratio of 1,100 scf/bbl and is likely to be commercial, the company said. 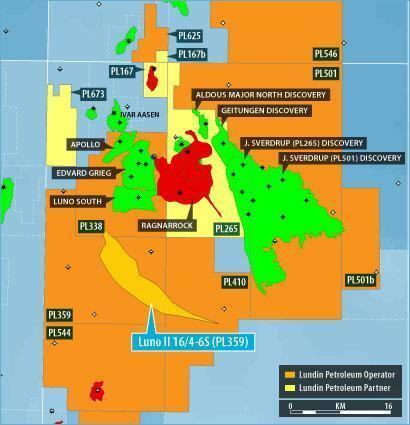 Lundin Petroleum estimates that the structure, believed to span two reservoir segments, contains a gross contingent resource of 25 million to 120 million bbl of oil equivalent as well as a gross prospective resource of 10 million to 40 million boe for the Luno II North segment. More prospective resources lie outside the two mentioned areas, the company said. The discovery well is in the southern segment of the Luno II structure. The well proved the presence of a Jurassic-Triassic reservoir with a 45-m gross oil column and proved an oil-water contact at 1,950 m below mean sea level. The oil is saturated and in contact with a gas cap. The well proved a 280-m sand sequence with fair reservoir quality. The contingent resources relate to the southern segment of the Luno II structure and the prospective resources to the northern segment. Appraisal drilling in PL359 is being evaluated for later this year to further delineate the southern reservoir segment which at the high end of the resource range likely extends into PL410 east of PL359. The lower end of the contingent resource range only reflects the northern part of the southern reservoir segment directly proven by the well. Lundin Norway AS has 40% interest in PL359, and Statoil Petroleum ASA and Premier Oil PLC has 30% each. Lundin Petroleum is moving the Bredford Dolphin semisubmersible that drilled Luno II to the company operated PL501 for more appraisal drilling at the Johan Sverdrup discovery. The 16/2-21 appraisal well is to be located in the central part of the discovery, previously referred to as the B location, with the objective to establish the depth, quality, and thickness of the Jurassic reservoir sequences. The closest well, 16/2-7, is 2.5 km east, and the 16/5-2S well is 3.8 km south, and the relatively long distances to the nearest wells reflects the size of the discovery, the company said. Well 16/2-21 is expected to improve the understanding of the field outline, the resource base, and the reservoir characteristics in this area. This will, in turn, provide valuable information for developing a drainage strategy and the upcoming field development decisions at Johan Sverdrup expected in the fourth quarter of 2013. Drilling time is estimated at 50 days to 2,050 m. This is the first of a three-well 2013 appraisal drilling campaign at Johan Sverdrup. Lundin Petroleum operates PL501 with 40% interest, Statoil Petroleum has 40%, and Maersk Oil Norway 50%.